I'm sorry for the delay in any new releases despite the exciting announcement back in June. I've been working slowly on cleaning and translating the first chapter of Fukushima Teppei's newest serlization, which after further inspection turns out to be a collection of short stories rather than one ongoing storyline. I've procured the second chapter as well- it's very different from the first in terms of setting and characters, but similar themes are there if you know where to look. I was busy with various things in the past few months, from work to my sister being married, so scanlations just kept getting pushed farther and farther down my to-do list. In other news, my mother was recently hospitalized with a very serious infection and gave us all quite a scare. My father and I were also placed on antibiotics for the vicious bug she had contracted, but all are well now and she's back home healing- some of my time and efforts are going towards helping her out, but little has changed in my life overall so you can expect things to come along sooner or later. 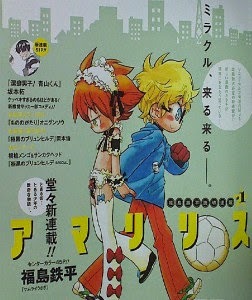 I think I'd like to aim for monthly releases at the moment, since Miracle Jump is a monthly comic. So that's all for now! Thanks so much for all your patience guys!! Hello fellow SU fans! It's been a long time since I posted anything here- I've been caught up in all kinds of things, fron work to Anime North to my fanfiction hobby! However, I have some good news! Fukushima Teppei has a new serlization at last!! 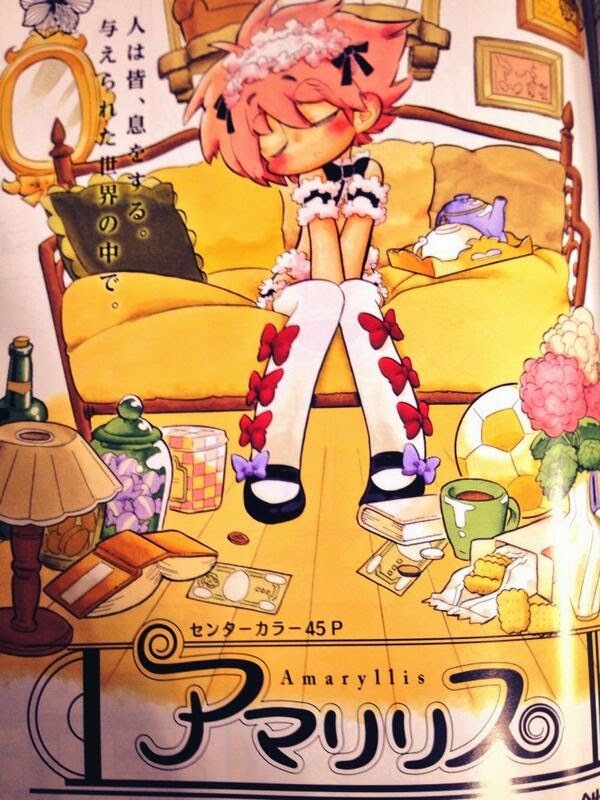 It's titled Amaryllis and began its run in the newly revived Miracle Jump magazine this month! You can see from the pictures above that it has a rather cute and fluffy appearance, but Miracle Jump also features series such as Brynhildr in the Darkness (from the author of Elfin Lied fame) and Tiger and Bunny, and they're nothing to shrug at. Will there be more than meets the eye with this series as well? It's Teppei we're talking about, I have no doubt!! Hello there fellow fans. Sorry for the wait! 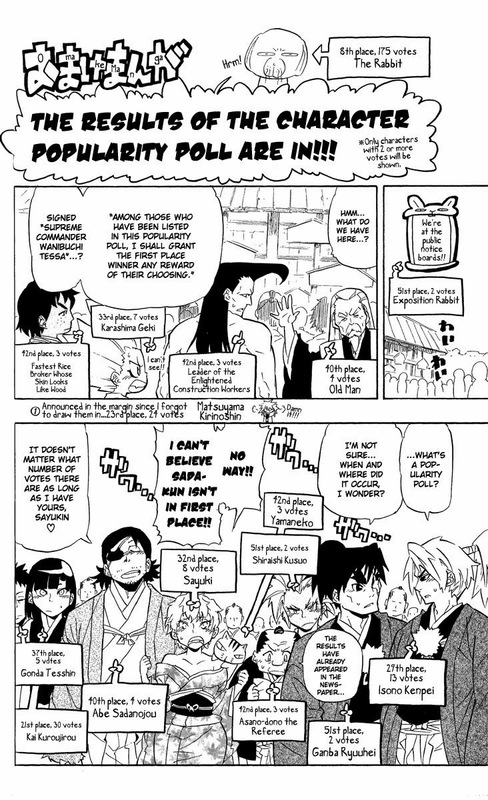 Here are the extra Afterwards pages from the final volume of Samurai Usagi. 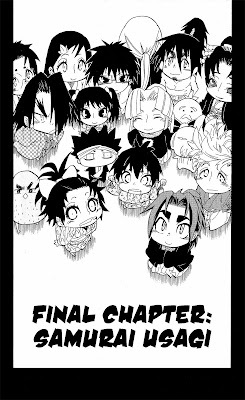 This chapter came as a bit of a surprise to me...but it was still a really nice closing chapter, since a lot of little questions about the official ending get answered. What did you think of this special ending? I'd love to hear your thoughts! P.S. I'm sorry I couldn't find the color scans for this release. If anyone was curious, Mitsuki's hair is light pink and her eyes are yellow like Shino's. Adorable!! HAPPY NEW YEAR EVERYONE!!!! 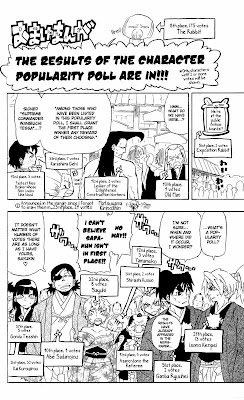 Here are the results from Samurai Usagi's character popularity poll that were included in the final volume!!! Gwaaah!! Sorry for the slow release, everybody!!! 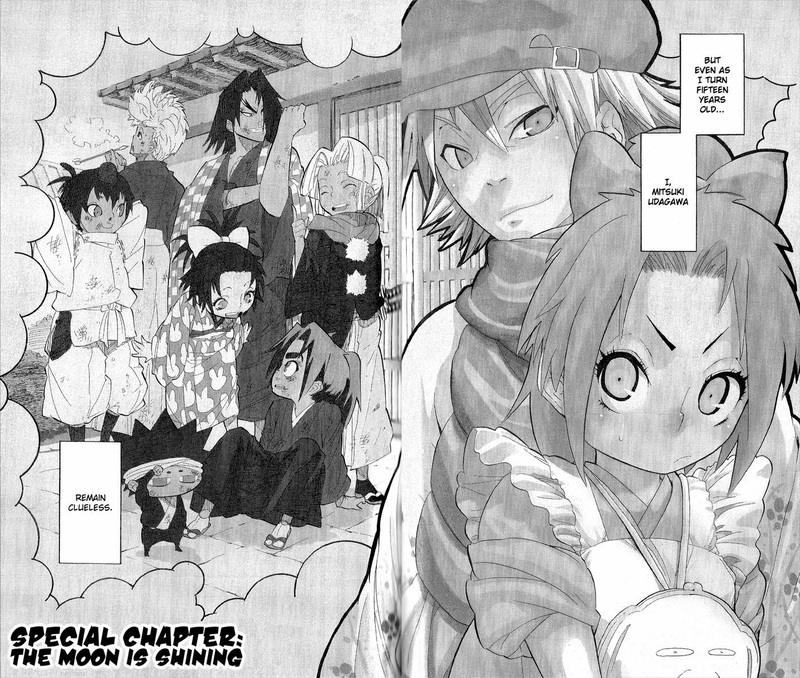 Here is chapter sixty-seven of Samurai Usagi. Also, some people have been asking me what I plan on doing once the manga is finished. Well! I still have to finish the one-shot of Fukushima Teppei's I collected some time ago (sorry for the wait, some parts of the dialogue are tripping me up >.<), and I'm always keeping my eyes open for new works of his. Along with that, I've also managed to get my hands on the Japanese novel 'Uchouten Kazoku' which some of you may know of given that it earned an anime adaption that aired this summer. 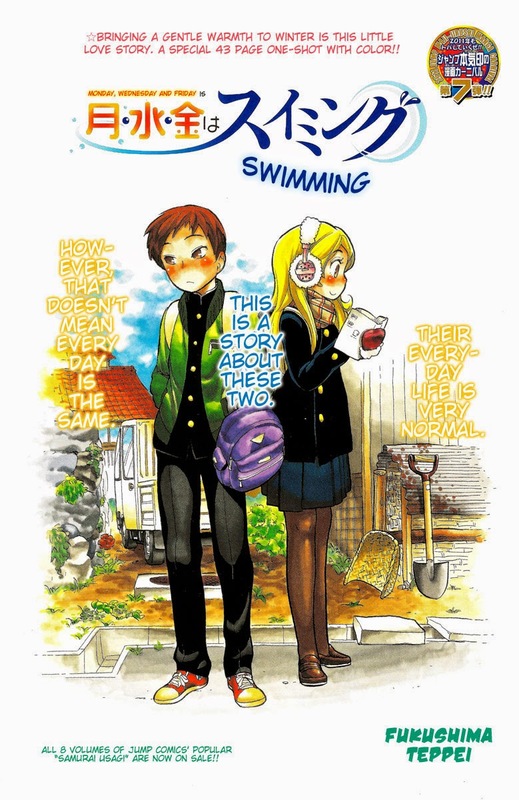 I love the anime to bits, so I'm really excited to start translating the novel!!! 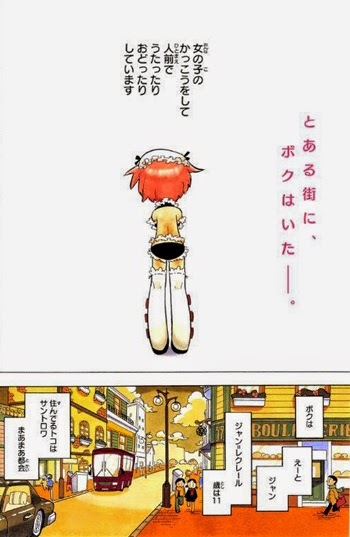 I would be happy to post chapters here if people are interested, but I'll probably hit up Baka-Tsuki and see if they'd like to add it to their archives- not sure about that since they only seem to do light novels, but we'll see. When I have free time I might like to go back and do the first volume of SU myself, just to have the chapters on my computer/ give people a chance to read things with better grammar. I'll post those here are well. Finally, if anyone happens to have something they'd like to see translated, please feel free to send it my way and I'll see what I can do!